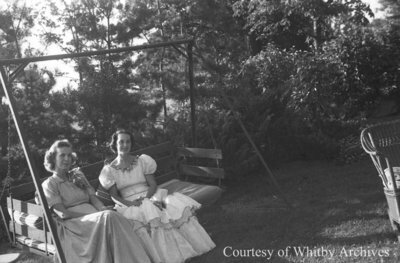 A black and white negative of Thomasine (Tommy) Arnold (left) and an unidentified woman at Arnhills in Pickering, Ontario. In this view they are sitting together on a swing. Trees and shrubs are visible in the background. Arnold Family, August 18, 1939, Marjorie Ruddy. Whitby Archives A2013_040_775B.